Kleine Haie Grosse Fische – Nordic midnight snack! Are you in desperate need of some savory food after a night of dancing at the Kiez? But do you want to stay in your non-touristy vacation mood and stick to a real Nordic snack? Then I suggest you stop by Kleine Haie Grosse Fische (= small sharks big fish). This place is perfectly located right next to the Hans-Albers-Platz, close to our harbor and opens almost all night, so it’s perfect for all the hungry party people who don’t want to go to McDonald’s. 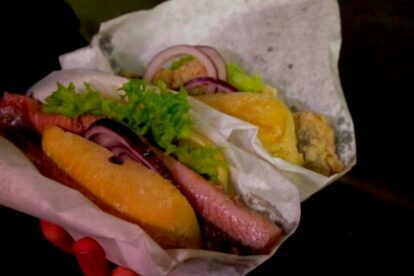 The guys who own the restaurant produce some of the best Fischbrötchen (bun with fish) in Hamburg and you will get to choose from all kinds of different fish, like Bismarck herring, salmon, fried herring, homemade fish patties or crabs. You can also try their Störte-Burger (Störtebecker was a very famous pirate in Hamburg). My personal favorite is a bun with Matjes herring and onions – if you want the total Hamburg experience, pair it with an Astra (the typical beer from Hamburg). Another really nice point about this place is that there are great concerts, readings and other cool cultural events on a regular basis. Enjoy!